December 08, 2013, 11:00 a.m.
With the rise of online dating sites, the art of love sometimes feels like it is being broken down into a science; scientists even claim to have developed a love-test that can predict the success of relationships. But whether you find love through an algorithm or good old fashioned “love at first sight” – one unfortunate but often inevitable consequence is heartbreak. 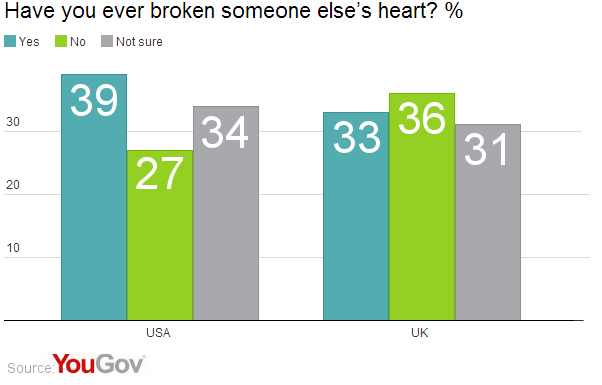 New YouGov research looks at the prevalence of heartbreak on both sides of the Atlantic, and finds that while a majority in Britain (61%) have had their heart broken, the phenomenon seems more prominent in the US where 79% of people have experienced heartbreak. Despite social and political differences, more people in every demographic have had their heart broken than have not. 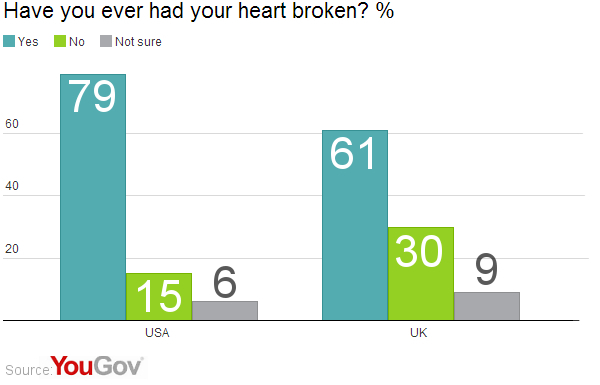 However women in both countries are more likely to have suffered heartbreak, even if British women (65%) are less likely to have than American women (85%). In contrast, only a third (33%) of British adults admit to breaking someone else’s heart, while 36% say they have not. So if so many people have had their heart broken, and so many fewer have broken someone else&apos;s heart, where is all the heartbreak coming from?